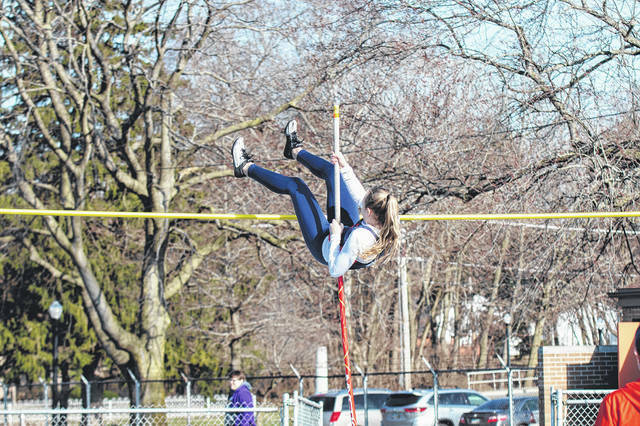 GALION — Back on Tuesday, April 2, the Galion Tigers track and field teams welcomed the squads from Lexington, Ontario and Pleasant to Heise Park to compete in a quad-meet. 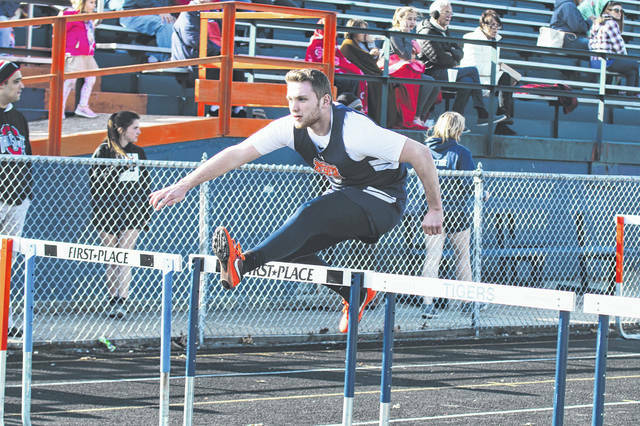 When all was said and done, the Galion boys would claim first place in the four-team field while the Lady Tigers snagged a runner-up finish behind Lady Lex. Scoring for the boys field went as follows: 1. GALION- 96; 2. Ontario- 62; 3. Pleasant- 57 and 4. Lexington- 45. For the day, Galion’s boys would claim eight individual event wins and earn a first-place finish in every relay except the 4×800-meter event. Leading the way for the Tigers in the individual events were Evan Barker and Braxton Tate, earning two wins apiece. Barker finished atop the field in the 100-meter dash (11.63) and the 200-meter dash (23.69) while Tate conquered the distance events by winning the 1600-meter run (4:40.75) and the 3200-meter run (10:36.40). Also capturing first-place points for Galion in the track portion of the day were Jacob Williams and Colbey Fox. Williams won the 400-meter dash in a time of 53.85 and Fox outlasted teammate Jack McElligott in the 800-meter run, winning in a time of 2:15.43. The Tigers’ other two individual event wins were provided by Noah Atkinson in the discus with a heave of 138-feet, 9-inches and freshman Hanif Donaldson in the high jump with a bound of 20-feet, 11-inches. Galion’s 4×100-meter relay team won in 45.90 while the 4×200-meter relay team dashed to a win in 1:36.75. Rounding out the relay wins for the boys was the 4×400-meter relay foursome. Other placements for the boys were: Kalib Griffin- long jump, 2nd; McElligott- high jump, 2nd and 800, 2nd; Caleb Branstetter- high jump, 3rd and 300-meter hurdles, 3rd; Brayden Eckels- high jump, 4th; Ben Alstadt- pole vault, 5th; Isaiah Alsip- 110-meter hurdles, 2nd; Trevor O’Brien- 110-hurdles, 5th; Carter Valentine- 300-hurdles, 4th; Corbin Justice- 300-hurdles, 5th and Wilson Frankhouse- 200, 5th. Scoring in the girls field finished as follows: 1. Lexington- 93; 2. GALION- 82; 3. Ontario- 54 and 4. Pleasant- 31. The Lady Tigers would also rack up eight individual wins on the day, led by Kerrigan Myers and Anna Court. Myers finished atop the field in the high jump with a height of 5-feet, 2-inches and then proceeded to win the 100-meter hurdles (15.12) and the 200 (26.88). Court dominated the throwing events, winning the discus with a toss of 115-feet, 7-inches and the shot put with a heave of 31-feet, 7-inches. Other winners on the day for Galion were Kaitlin Bailey, Brooklyn Cosey and Zaynah Tate. Bailey paced the field in the 400, winning in 66.84 while Cosey captured the win in the 300-hurdles with a time of 51.50. Tate rounded out the Lady Tigers’ victories by winning the 800 in a time of 2:37.38. Galion’s girls relay teams finished third in the 4×800-relay, the 4×200-relay and in the 4×400-relay on the day. Other placements for the Lady Tigers on Tuesday were: Kasidee Sinclair- shot put, 4th; Jalyn Oswald- long jump, 3rd, 100, 3rd and 200, 5th; Cosey- long jump, 4th and 100, 5th; Samantha Comer- high jump, 3rd; Kayla Hardy- pole vault, 2nd; Myers- 400, 4th and Ava Smith- 800, 2nd.